A strike had been percolating for weeks before 2,600 workers from 11 unions at the Examiner, the Chronicle and the San Francisco Newspaper Agency walked off the job Nov. 1, 1994. Four days of round-the-clock negotiations hit a logjam over salary and job security, but by then, a solid structure had been formed for a strike. Nonetheless, workers had no clue how long they would be off work. Management brought in outside guards and hired heavy-handed law firm King and Ballow. 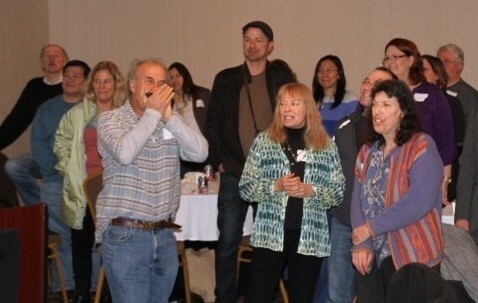 Steve Rubenstein plays harmonica as his spouse, Caroline Grannan looks on. Steve and Caroline were part of the SF Newspaper Strike of 1994. Photo by Kat Anderson 2014. While staffers picketed at various locations, they also managed to knock out a top-flight strike paper, the Free Press. And oh, didn’t it rain. As a steady downpour drenched the striking workers down to their socks, community support flowed: Jehovah’s Witnesses, along with area restaurateurs, brought food. Drivers honked their support. Mom and Pop corner stores happily replaced stacks of newspapers with stacks of the Free Press. Working in the strikers’ favor: robust ad revenues, few exempt employees, and a sense of their own strength, When it was over, returning workers encountered two markedly different scenarios, with Chronicle management striking a welcoming, conciliatory tone and Examiner higher-ups lashing out – singling out ringleaders for retribution. Steve Rubenstein, San Francisco Chronicle: In the days leading up to the strike, there was a sense of nervousness, apprehension, quiet fear. But everybody felt united. My proudest moment was as picket captain: I had my trumpet and played it. My wife had our infant daughter on her back, our 3-year-old son Willy by the hand, and our dog Sally. I remember it rained and rained and rained. The Guild rented a cable car and we rode around town. There was a lot of good unity spirit. It was invigorating. A lot of the managers were on the picket line with me. Management hired outside guards and a union-busting law firm. They put a fence around the loading dock. Guards were brought in on buses. Then we all went back to work together. I still have my pins, my buttons, my strike hat. I thought they were important to keep. I miss the newspaper; I miss my career. But now I love my career as a teacher. (Today), the total dynamic has changed. (The workers) became convinced they had to make compromises. Caroline Grannan: I found it really scary because we had no idea what the outcome would be. We had a unique situation because (husband Steve Rubenstein, Chronicle writer) already had a trip out of the country planned after Day 5 of the strike, and that’s when I stepped in to do his picket shifts — because I decided I had to do whatever I could to make a show of unity and strength. There were something like 11 unions participating. (Some blue-collar union members) would shout “f*** you!” at scabs. I thought, oh no! My daughter’s first words are going to be “f*** you.” It was just pouring rain. One day management sent out a certified letter saying if we didn’t return to work we would be replaced, which didn’t happen. There was a lot of community support. The Mime Troupe had a drum corps. After the strike, it initially felt like we had just staved off disaster, but later it started to feel like we had actually won. That experience taught me that it’s worth fully committing to an effort if the goal is important — which can apply to the personal and the political. What happened to the newspaper industry a few years later puts the whole thing in a different light, but it still felt like a victory. Jane Kay, environmental reporter, the Examiner: It was a surprise to me that something that lasted such a short time had such a lasting impact on me. I still have my picket sign, “Workers on Strike,” covered in (rain-proof) plastic. I was so impressed by the bravery and the courage of everyone involved. We didn’t know it was going to be over when it was. We had to pay rent, mortgages, support elderly parents. Only six people crossed the picket line! All the principles that make people good journalists compelled them to honor the strike. On the ground, we tried to keep the trucks from going out. We were producing the Free Press. We broke the story that white women in the Bay Area had the highest incidence of breast cancer in the world. John Flinn, the travel editor, heard the tip when he was writing a feature on breast cancer survivors climbing a mountain to celebrate their victory. He called me, I called the Northern California Cancer Center and checked figures from the World Health Organization, and we broke the story. There were so few exempt positions then. The assistant city editors, desk editors, were all union. It meant so much when people like Herb Caen and Rob Morse came out. The debates that led up to the strike votes were pretty tense. We were at the M&M waiting when we got the word and we went out on Mission Street. Then, when we (settled), I was with Ricardo Sandoval and Susan Ferriss. We were just jubilant. Returning to work at the Examiner was difficult because many of the editors were mad at us. Carl Hall, Chronicle science writer, Guild mobilizer: It was really a shame because Will Hearst felt betrayed by his staff. I heard him on KQED saying he had thought we were all in it together. We all liked him. He had tried to do some interesting things. He just didn’t get it – that we need money to pay our rent, that we need medical benefits. The Teamsters were the heroes. They were the ones who blocked the delivery of the papers. (Returning to work) Bill German set a classy tone. Matt Wilson was at the front door, shook our hands as we walked in the door at Fifth and Mission and welcomed everybody back. I gave a speech, management gave a speech. There was a tone of healing, putting the rancor behind us. We had the opportunity to take the spirit and passion we saw on the picket line and put it into our journalism. Management’s classy tone allowed us to let bygones be bygones. The first day back, what I heard from the Examiner was petty. The quality of the Free Press was tops. Susan Yoakum and Pam Birdman did a story on immigration. Some people questioned reporting on Dianne Feinstein’s undocumented housekeeper. We didn’t want to piss off the democrats. I was on leave for a year to organize. I worked with Doug, mobilizing, putting all the newspaper unions together: the Teamsters, the mailers, the printers, the paper handlers, the typographical workers, the pressmen, the electricians, automotive, janitors, the vendors. And the San Jose Guild. Larry Hatfield came up with the title: I was the Minister of Agitation. We had a committee of 100, all doing active stuff. We made union member condoms; we handed them out at the Gay Pride Parade, and we were in the parade. We did musical events – I was in the band. We made T-shirts. Eddie Rosario, one of the pressmen, was the drummer. We tried to dip into the working culture in San Francisco, (garnishing the support of) retail clerks, hotel workers, construction trades, transit workers, teachers. We had allies all over town. I walked down from the Nob Hill hotel where we had been bargaining. By the time I got there the pickets were starting. I shouted at John Sias (CEO of Chronicle Publishing Co.), the start of a two-week screaming match. Then they brought in King and Ballow, a Tennessee-based union-busting law firm. It had a lasting impact. I bowed out of active Guild duty and other people got involved, which was good. But this became a permanent part of my working life. We have to be prepared to work hard for workplace justice. And we took a principled stand for solidarity with the other unions. We should be thinking more of solidarity today. Pat Yollin, the Examiner: I was an assistant metro editor, working on the city desk at the San Francisco Examiner, when the strike occurred. I’d been at the paper since 1983. More than anything, I remember the rain — cold, hard and relentless. It rained six of the days we were on strike. Someone in top management at the Examiner said she’d never been so glad to hear rain fall. My picketing shift was 4-8 p.m. at Fifth and Mission. It was a good place to be, compared with the bureaus or the printing plants. Strangers brought us food, and people driving by honked their support. There was a phenomenal outpouring, and that helped a lot. Before the strike started a fence was put up around the parking lot next to the Examiner side of the building, where the loading dock was located. Management and scabs were driven into the lot in vans, and they scurried into the building through a side door. The lot was protected by goons supplied by Huffmaster in Michigan. To this day I refer to that place as the Huffmaster Lot. Soon after the strike started, every striker from The Examiner got a certified letter in the mail — return receipt requested and dated Nov. 2, 1994 — from William R. Hearst III. The full-page letter was more chilling than the rain. “We sincerely regret that you have seen fit to go on strike,” the letter started. “… We are extending an invitation to you to return to work in your regular position no later than the beginning of your shift Wednesday, November 9, 1994 but no later than 5:00 p.m. of that date. The strike ended relatively quickly, but of course we had no way of knowing that would happen. Managers called strikers at home who seemed the most vulnerable or susceptible — such as a single mother with a young daughter. One hard-working regular stringer, desperate to be hired by the paper, was offered a permanent job if she’d cross. She didn’t.